Does bike lane legally continue through the intersection? I usually write posts mostly from my viewpoint because I want my blog to be mostly from my viewpoint. I am making a rare exception with this post because I am not a legal expert and my last post happened to be about Bend. 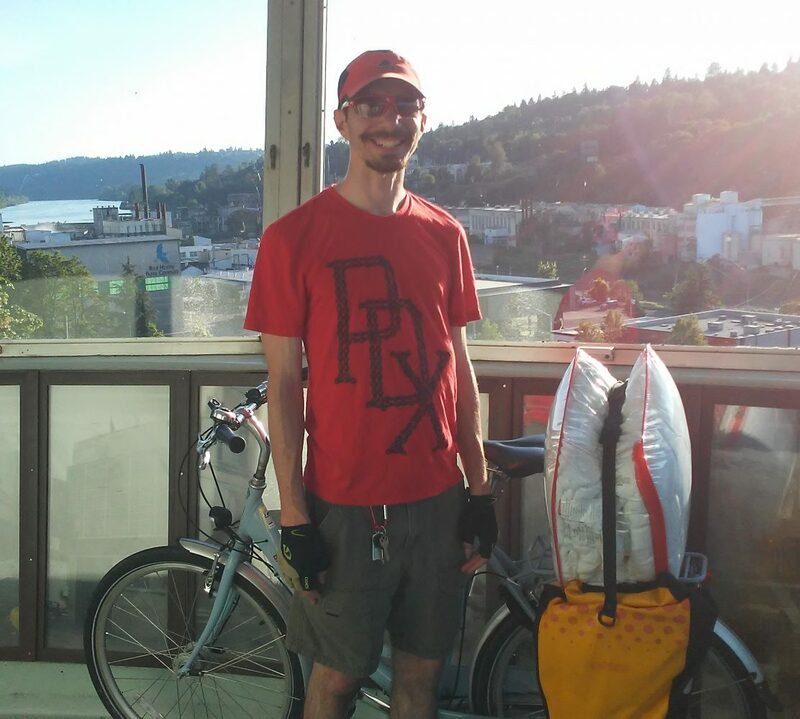 While I read BikePortland almost daily and many of their posts fascinate me, I chose to make a rare exception to write about this post because Jonathan Maus thoroughly researched the legal issue and it raises questions about what I experienced in Bend. Before I read Jonathan’s post, I thought it was common sense that a bike lane legally continues through the intersection. I am shocked by Deschutes County Circuit Court Judge Adler’s ruling. Judge Adler ruled that he saw “no authority” to support the contention that bike lanes continue through intersections in Oregon. While I have never had any personal legal issues while biking, do I need to start leaving the bike lane and using the travel lane when going through intersections in Oregon to prevent my legal rights from being lost? As comments below Jonathan’s post explain, I am not the only cyclist in Oregon asking this question. I also found the below statement interesting. Even in bike-friendly Oregon, it is believed that people do not treat bike lanes like travel lanes. As someone who bikes daily in Oregon, I agree with this perspective. While neither type of lane physically (no paint) continues through the intersection, I have not seen anyone questioning whether the travel lane legally continues through the intersection. Why does the same not apply to the bike lane? Prosecutor Andrew Steiner said many people today do not treat bike lanes like vehicle lanes, though they are. Since I am a geographer, I would normally have started this post with where the bike lane is located in Bend. I felt readers needed the legal and culture details to fully understand the bike lane legal issue, so I postponed sharing the bike lane location. While the below Google Maps screenshot shows green lines for where the bike lanes continue through the intersection at NW Wall St and NW Olney Ave, the white bike lane paint does not actually continue through this intersection. The white bike lane paint stops where the intersection begins and restarts where the intersection ends. The same is true for the travel lanes. You are probably as confused as me after reading this post. Since I do not want to change how I bike through intersections in Oregon, I hope I can trust what Jonathan wrote in his 2018 post. Let’s be clear: Even though the legal definition of a bicycle lane (ORS 801.155) doesn’t specifically address intersections, the legal protection of a bicycle lane absolutely does continue through an intersection even if the markings do not. Jonathan’s viewpoint is shared by former Portland Police Bureau Captain Bryan Parman. Kannapolis has many roads that serve primarily motorists while creating unsafe conditions for pedestrians, cyclists and transit users. 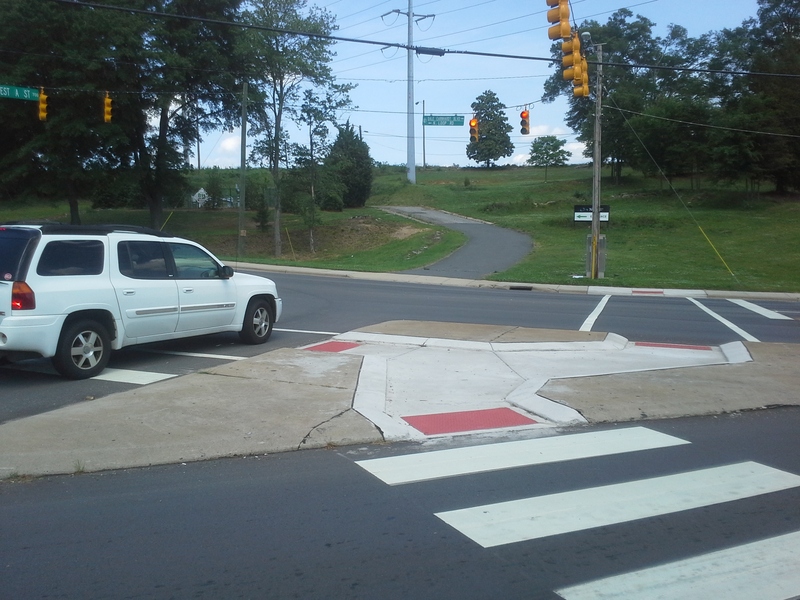 Kannapolis needs to design roads that are safe for all road users, including motorists. Through making the roads safe for walking, bicycling and using transit, Kannapolis will also make the roads safer for driving an automobile. Since I feel motorists are often excluded from conversations about other modes of transportation and don’t understand the value of designing roads for all road users, I want to make it abundantly clear that redesigning roads for all road users will make the roads safer for motorists as well. This means all road users are benefiting from my advocacy and planning work. Most pedestrians in the South fit into this “Interested but Concerned” group as well. One of the reasons I feel this is true is because, as one can see in the below photo, most pedestrians would feel unsafe walking on this sidewalk. The sidewalk is unsafe because it is installed adjacent to the road without any physical separation from the road. 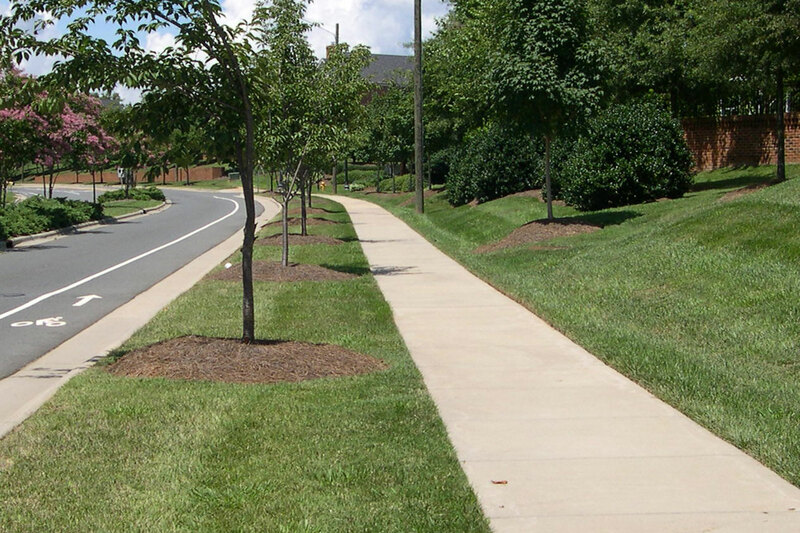 The below photo, which is from Charlotte DOT, is a great example of how a planting strip can be used to provide physical separation from the road. I would feel much safer walking along this road than Loop Road. Another pedestrian and cyclist safety issue in the Loop Road photo is how the 8th Street Greenway abruptly ends on the north side of Loop Road without providing users a safe and convenient option to cross Loop Road to the North Carolina Research Campus. The nearest signalized intersections are North Main Street and West A Street, which have standard crosswalks but no pedestrian signals. 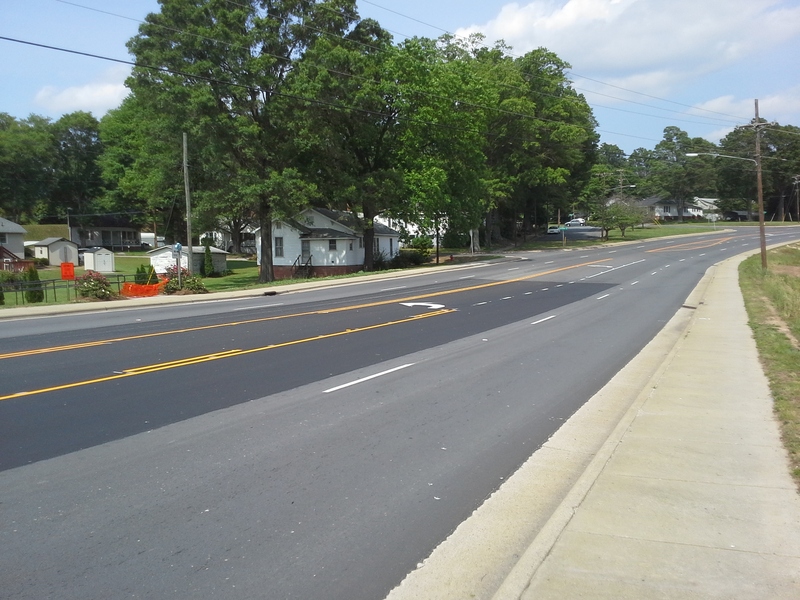 The below photo, which shows the intersection of Loop Road and West A Street, could be improved for pedestrian safety by installing ladder crosswalks, pedestrian signals and median refuge islands on Loop Road. The motorist stopping beyond the stop bar in the crosswalk doesn’t help with making this intersection safer for pedestrians. Thankfully, as the City of Kannapolis’ website shows, Kannapolis is working to redesign Loop Road to make it safer for all road users, especially the “Interested but Concerned” cyclists and pedestrians. 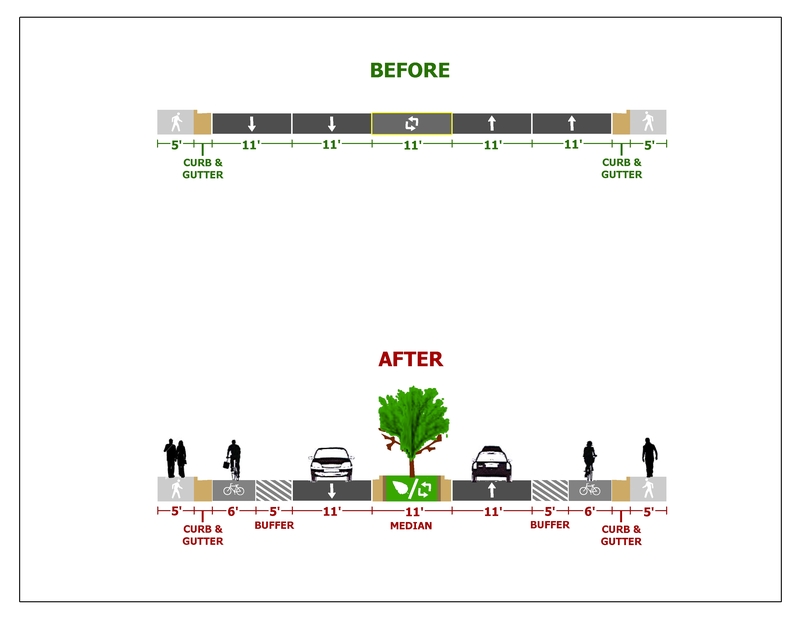 The potential redesign of Loop Road involves a road diet, which in this case means “converting the outside travel lane to a buffered bicycle lane from West C St around to North Main St.” As this article from PeopleForBikes on protected/buffered bike lanes discusses and the below infographic shows, this redesign should encourage cyclists, especially the “Interested but Concerned” cyclists, to get their bike out of their garage and bike on the road. For those unfamiliar with what road diets and buffered bike lanes are and the benefits of installing both together, Streetfilms produced the following video about road diets and the Green Lane Project produced the following video about the rise of buffered/protected bike lanes in the US. Since Kannapolis is a small city and all the cities shown in the Green Lane Project’s video are large cities, one may wonder if buffered/protected bike lanes are being installed in small cities. As the below Streetfilms video shows, small and medium sized cities throughout the United States are installing buffered/protected bike lanes. Will Kannapolis, NC join these cities? Here is a cross section and project maps for the proposed road diet and buffered bike lanes on Loop Road. According to the Green Lane Project, which is a People For Bikes program, Kannapolis would be the first city in North Carolina to have a buffered bike lane if it installs the buffered bike lanes on Loop Road. Visit the City of Kannapolis’ website for more information about the proposed project. Since I will be in Charlotte tomorrow to watch The Human Scale, my next post will be delayed. I plan to discuss the complicated bike connection between where the proposed buffered bike lanes on Loop Road end and the proposed bike lanes on Mooresville Road end.